It was another weekend full of outstanding achievements, highlighted by Cathy McCourt’s victory in the Northern Ireland and Ulster Trial Race for the British and Irish Veterans Cross Country, to be held in Wales on November 16th. 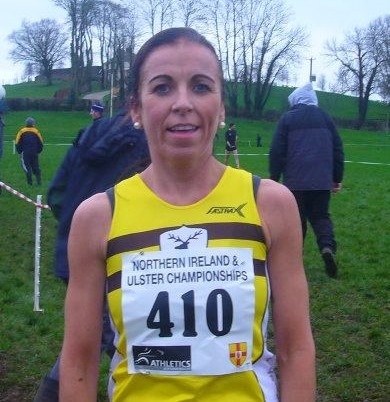 Cathy led a total of eight Harriers whose performances on the Dub Fields in Belfast on Saturday earned them places on the Northern Ireland and Ulster teams. 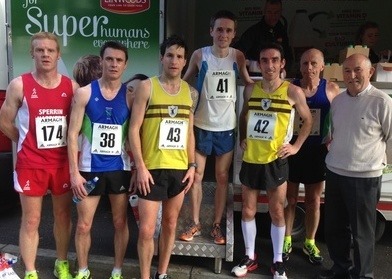 And at the popular Armagh Ten Miler on Sunday, Harriers dominated the podium positions with Alan O’Hara (53.10) and Connor Magill (54.45) claiming second and third and Heather Foley finishing second in the women’s race (1.03.01). Cathy continued her successful comeback from injury at the Vets trial, pulling away on the last lap of the 6km course to finish nine seconds clear in 22.06, winning outright and finishing first in the V40 category. 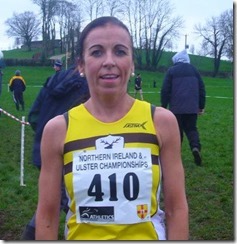 Next was Amanda Perry, who was 7th overall and 3rd in V40, also earning a spot on the Northern Ireland and Ulster squad. They were supported by Helen Weir (V40, 26.17) and Paula Wallace (V45, 28.32). In the men’s V65+ competition, contested with the women’s race, Drew Crawford (V70, 36.20) booked his slot on the Northern Ireland and Ulster team. There were also a number of fine runs in the men’s 8km race, led by Eamon White, who was second overall and first in the V40 category in 26.12. Laurence Johnston was another category winner, claiming the V55 prize in 28.54. In overall finishing order, others competing were Neil Carty (V45, 26.55), John Patience (V50, 28.57), Simon Reeve (V35, 29.11), James Wallace (V50, 29.53), Derek Donaghy (V55, 30.27), Jim Newberry (V60, 30.45) and Greg McClure (V55, 33.29). 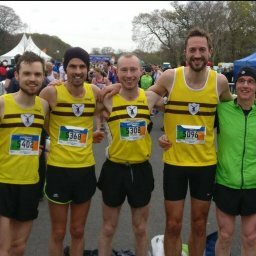 Twelve harriers travelled to Armagh for the long-established ten miler on Sunday, and were led home by three podium finishers. 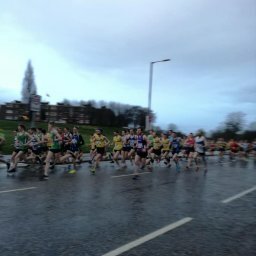 In the men’s race, Alan O’Hara finished second in 53.10, a good time on a hilly route, as Annadale star Ed McGinley gradually pulled away to win in 51.02. Connor Magill was a solid 54.45 for third, while Heather Foley continued to run well to claim second in the women’s race in 1.03.01. Michael Fitzpatrick was next home in 58.48 for 15th, while Niall Farquharson was one place outside the top 20 in 1.00.36. Other Harriers completing the course were Alan Ritchie (1.04.19), John McConnell (1.05.09), Mark McCallion (1.06.14), Gerard McNamara (1.06.33), Philip Donnelly (1.08.35) and Greg McClure (1.08.53). 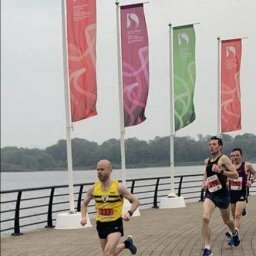 At the scenic GR8 Dundrum Run on Saturday, Brendan Grew led home a strong contingent of Harriers and rapidly improving ‘Couch to 5k’ runners with a fifth place finish in 47.14. The 8-mile route includes both road and off-road running. Next home were Martin Cox (43rd, 0:53:47), Robert Irvine (48th, 0:54:15), Colin Simpson (56th, 0:54:45) Athanasia Sevastaki (103rd, 0:57:43), Mark Shields (115th, 0:58:47), Paul Williams (0:59:00), David Woodhouse (59.34 ) John Burns (1:03:33), John Gribbin (1:04:23), Siobhan Drain (1:05:21), Lance Breen (1.07.29), Stephen Thompson (1:07:40), Kilian Woods (1:08:11), Lynn McCullough (1:08:51), Mary Reid (1:14:46), Jackie McCreesh (1:21:57) and Kerrie Thompson (1:22:09). 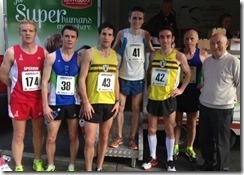 Further afield, Paul Blaney ran a solid 16.16 in the Sligo 5km. Despite the heavy racing schedule elsewhere, there were still plenty of Harriers who took part in the Parkruns. Ireland’s Parkrun director Matt Shields helped open the first ever Parkrun in Armagh, completing the course in 19.48 and finishing second. At the Waterworks, there were six Harriers in the top ten, led home by Stephen Walker in 17.52. At the City Parkrun in Craigavon, Peter Savage won in 17.31 while Jim Clinton ran 25.13 in the Falls.